Poraniomorpha hispida, copyright Claude Nozères. 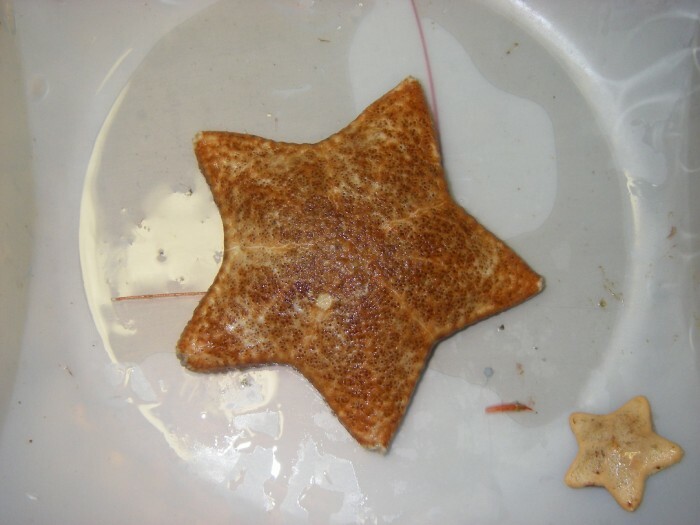 The Neoasteroidea represents the starfish crown group, including all living starfish and all known Asteroidea from the Mesozoic and Cenozoic eras (Blake & Hagdorn 2003). Characters (from Blake & Hagdorn 2003): Axillary or axillary series absent. More or less extensive actinal series differentiated ventral to marginal series. Actinals in basal taxa more or less irregular in form and arrangement but with longest series adjacent to marginal series. Adambulacrals overlapping in distal direction. Adambulacrals little wider than ambulacral articular flanges; ambulacrals typically larger than adambulacrals. Longitudinal ambulacral connective surfaces inclined proximally such that proximal flange of each ambulacral more or less clearly overlapping distal side of more proximal ossicle, ossicular form is not bilateral. [BH03] Blake, D. B., & H. Hagdorn. 2003. The Asteroidea (Echniodermata) of the Muschelkalk (Middle Triassic of Germany). Paläontologische Zeitschrift 77 (1): 23–58.